Bonnie Landau, author of Special Ed Mom Survival Guide, will visit the Ojai Library at 2 pm on Sunday, January 28, 2018 to deliver a talk entitled “Calming the Hyper Child: practical tools for school and home.” Mrs. Landau is an Ojai resident, author and consultant for parents whose kids struggle to learn in traditional settings. There are many reasons kids find it hard to be calm. 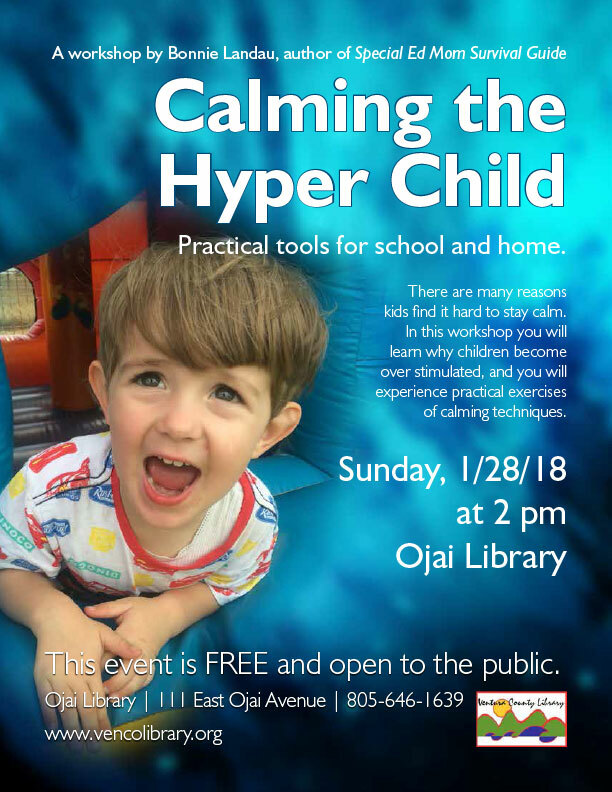 Bonnie will provide information on why children are hyper or over stimulated, and she will discuss practical examples of calming techniques. She will demonstrate ways to calm kids and strategies for reducing anxiety over time. This event is free and open to the public. For additional information, contact Ron Solórzano, Regional Librarian, at (805) 218-9146 or visit www.vencolibrary.org. The Ojai Library is located at 111 East Ojai Avenue in Ojai, CA. Hours of service are 10 a.m. to 8 p.m. Monday through Thursday and 12 p.m. to 5 p.m. Friday through Sunday.